Below are the three cards we'll be making during our stamping class on Wednesday. There are two holiday cards and one birthday card. The first Christmas card features three triangular trees that have been textured and distressed with gold ink in the Cuttlebug. You'll also be punching a border with a Martha Stewart snowflake edger. The sentiment stamp, 'A Very Merry Christmas,' is from the SU Punches Three. After stamping, it was punched out with an SU scallop square. The SEI red glitter paper makes a stunning background! The holiday card was made with the SU Season of Joy Christmas tree, which was stamped in Wasabi ink onto Whisper White card stock and then trimmed out. Happy Holidays sentiment stamp is from SEI, and it was stamped with Memento Lady Bug Red onto a gorgeous Bazzill gold toned cardstock. In addition, a Spellbinder ribbon buckle in gold adorn some double dot BoBunny green ribbon. Creative Imaginations whimsical Christmas paper creates the background. The quirky and fun birthday card features a QuicKutz die and DCWV Green Woodlands Bird paper. The sentiment stamp is from Inkadinkado. In the UK, they call these stamps Stick Leg Chicks; in the US, they are known as Karen Stolper's stamps. Whatever you call them, I am sure you'll agree that they are quirky, unique and worth a giggle! I used Karen Stolper's scary cat and pumpkin stamp to create these very spooky ;-) cards for an art swap with my friends in the England Stamping yahoogroup. In addition, this will be one of the cards available to make at my October 7th Rubber Stamping class for American Women of Surrey. For those of you planning to attend the class, you will have a chance to color with Copic markers and cut out and antique a die cut pumpkin. With that in mind, I decided to create an autumnal notebook. This will be the free make-it-and-take-it project that I will demonstrate for my Introduction to Stamping Class, which I am offering through the American Women of Surrey. I've used Inkadinkado clear stamps, Bazzill Cardstock, and Stampin' Up ribbons to create this easy-peasy book. Elzybells Blog Challenge 26 is to create your own stamped patterned background paper. Yesterday, I ordered some of Elzybells brand new stamp sets, which feature my favorite things: stamping and crafting! I had to have them (especially the stamp that says: My husband lets me have all the craft supplies I can hide). I was thrilled when they arrived in the post this morning -- all ready! Yippee! As you can see, I used Elzybells new stamp sets to create this card. I love the manic crafter! The patterned background features Nancy Judd's Scrappy-Spots technique published in Techniquejunkies newsletter, and it is a type of masking. The primary colors used are Stampin' Up's Barely Banana, Really Rust, and More Mustard. A selection of Copic Ciao markers were used to color the Elzybells image. More 3 by 3 Cards! I've been working on projects for my autumn paper crafting classes, including this cute little 3 x 3-inch polar bear card, featuring a brand new Imaginisce clear stamp. I used Copic Ciao markers to color the images. As you can see, much of the coloring is a slight shade on the edge. Very easy. I cut out all the pieces for my future students; these cards with envelopes will be a snap to put together. I realize that the sun is still shining and the summer is still in full force. However, I decided to break out some autumn stamps to prepare for some classes that I hope to teach in the Fall. I love Karen Stolper's Stick Leg Chick Stamps, and I purchased a dozen of them recently from sirstampalot.co.uk, which is based in England. I used the Pumpkin Patch stamp to create this card, which features Stampin' Up designer paper and cardstock. The image was stamped with Memento rich cocoa and colored with Copic Ciao markers. Caroline, a fellow stamper, celebrated her birthday this past week. Happy Birthday, Caroline! Here is the cupcake birthday card that I sent her; it features Stampin' Up's Crazy For Cupcakes stamp set. I have a few different versions of the cards, as you can see. The designer papers are from BoBunny. The cupcake was made by stamping onto an ivory cardstock using a Chocolate Chip SU ink pad. It was heat set with a pearlescent embossing powder. A second cupcake was embossed onto the coral colored BoBunny paper. I cut out the bottom of the cupcake from the coral colored paper and glued it onto the cupcake stamped on the ivory paper; I then cut out the cupcake. Creamy colored Copic Ciao markers were used to color the cupcake icing. A selection of other Copic Ciao markers were used to color the candle, sprinkles and flame. The circular cutout was made from ivory cardstock and a Spellbinder's Nestability die. I used Stampin' Up Groovy Guava to distress a Cuttlebug embossing folder, sandwiched in my die cut circle, and ran it through the Cuttlebug. The Make a Wish stamp is from Woodware. It was inked with Stampin' Up Chocolate Chip ink and heat set with a pearlescent embossing powder. BoBunny gingham green ribbon was used on one card; the two other cards have Stampin' Up Groovy Guava ribbon. This is one of Elzybell's latest clear stamp sets, Spring Cubes. I adore this set! It has great sentiments, too. The white card stock was first run through the Wizard with a small square Spellbinder's Nestability die to create a peek-a-boo window. The image was stamped inside the card, so it would show through the window. It was colored with Copic Ciao Markers. Then I made a curtain template and used designer paper to cut out pretend curtains. I thought that red polka dots would complement the little lady bug. I can't stop coloring! I just can't stop! Fortunately, I am not alone. Yes indeedy, there are other coloring fanatics out there who are addicted to Copic Markers. You can find a lot of them posting their artwork on the weekly Copic Colour Challenge blog. Currently, they are seeking out a talented and enthusiastic crafter to be a Guest member of their Design Team. To be considered, we have been asked to link our fave Copic Marker creation. Here is my latest, which features a Craft UK stamped image that has been colored with a myriad of Copic Ciao markers. I'm very happy with the way the coloring turned out on this project. First of all, I wanted the door to have a feeling of 'life,' showing reflections of light and weathering. In such a situation, you wouldn't want to just stick with red tones. The door was colored by strategically applying a pale yellow (Y11) and then a golden yellow (Y17). Then, the two reds (R17 and R27) where used to color the door, with the darker tone used for creating shadows. Finally, I ran the Y17 yellow back over some spots to create even more of a highlight, or light bouncing off the door. This mermaid comes from Fred-She-Said, and it is absolutely perfect for coloring. 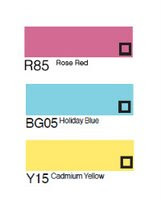 You can do a lot to create tones in the tail by using yellow, turquoise and pink. And here is something completely different! This is a photo stamp of an angel that I used on a card for a recent art swap. I used a Memento ink pad, the photo stamp, and glossy paper. Since Memento ink does not smear when using Copic markers, I was able to take some of my paler tones and tint this image. Using alcohol markers is a much easier and subtle way of coloring photo-realistic stamped images. The latest mingle over at England Stampers is Dressed to Impress, incorporating a die cut dress into our card layout. This is the type of card that can be really frilly and girly and summery! The template used on this card was inspired by Patty Bennett at Patty's Stamping Spot. You can find her tutorial for the dress card here. To begin with, I used the largest scalloped circle die from my Spellbinder's collection, and I ran through my colorful pink Prima paper to create a scalloped circle. Then I used Patty's dress shape to cut out my dresses. The stamp is from Stampin' Up . . . the little rose and the designer patterned paper is from Prima . . . isn't the paper GORGEOUS?! It's their flirty collection. We are having an art mingle on our yahoogroup, England Stampers, and it requires using our alcohol markers to color images. I had been sort of stuttering and stumbling with this project . . . I had something in mind, and it was just not gelling. So I finally tossed that idea aside -- along with all the scraps of paper and images -- and started over. Ahhhhhh . . . I feel much better now. I reached for my trusty Elzybells Art Stamps, which work wonderfully with alcohol markers. Then, I popped over to the Copic Colour Challenge to see what colors they were suggesting this week. I then discovered that Elzybells is the sponsor of the Week 21 Copic Color Challenge! 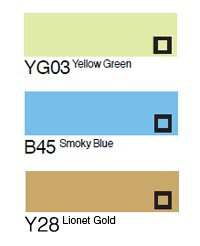 Here are the recommended colors. Yes, I really had ALL of them, and used them in my artwork. The Smoky Blue is one of my favorite Copic blue shades, and I use it all the time. In addition to the Elzybells Art Stamp, I also used Creative Imaginations gold embossed tea party paper, Prima flowers, and Stampin' Up ribbon. I'll mail the cards to the mingle recipients tomorrow, and I'm so much happier with the results! Here are two different Artist Trading Cards that I made for the Dragonflies, Damselflies and Butterflies Mingle of England Stampers. Enjoy the Simple Things is a sentiment stamp from Elzybells. The rest of the stamps are from Stampin' Up, including Botanical Blooms and Watercolor Minis. The other artist trading cards feature Stampin' Up's On Gossamer Wings retired stamp set, which has always been one of my favorites. It is one of the most realistic and amazing sets for capturing the spirit of real-life butterflies and dragonflies. This ATC was made by first spritzing rust-colored textured cardstock with gold glimmer mist. Bleach and vanilla pigment ink were used to stamp the images. The word stamps are from Inkadinkado Inchies collections. As usual, I seem to be missing the key colours noted in the challenge, but I was able to use many of the related colours to create this birthday card. Some of the Copic ciao markers that I used were YR23, Y21, Y17, Y15, Y02, Y00, R02, R05, E00, E02, E08, E31, E35, YG03, YG63, YG67, BG93. The stamp is Zinnia from the Flower Fairies collection that is based on the works of Cicely Mary Barker. This week, I made a birthday card for my stamping friend, Linda, of Linanna Designs. I had in my mind exactly the Elzybells stamp and the BoBunny patterned cardstock that I wanted to use. However, I also wanted to play the Copic Colour Challenge #18, and although this week's colours were close, they didn't quite match my cardstock. 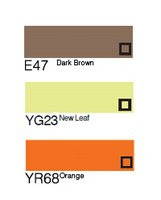 They suggested using the following colours. In the end, I used the Y15 Cadmium Yellow, but I used different blue tones -- B12 Ice Blue and B93 Light Crockery Blue. I did use a touch of the R85 Rose Red, but I also used RV42 Salmon Pink and some other pink shades that I forgot to record! I pulled out my Wizard and Spellbinder's Nestabilities Circles to create the interlocking circles on the birthday card. The birthday circle stamp is from Inkadinkado. While I was making cards, I also made a few spares with Elzybells sentiment: May all your days be filled with flowers. I just love this Whipper Snapper Design 'Feel Better Chicken' stamp. He is just way too cute! Also, Whipper Snapper Designs lend themselves to coloring with Copic Markers. I colored the image earlier in the week, and then I discovered I had used the colors specified in the Copic Colour Challenge! I put the finishing touches on the card this evening and entered it into this week's challenge, which suggested that we use R39, Y06 and R11 (I didn't have the R39 so I used R29 as a highlight on the wooden bed frame). I used other colors as well. You can play along, too . . . if you love Copic Markers, visit Copic Colour Challenge every Wednesday to see the new challenge! I know I'll be there! June is the time that many people walk down the aisle and take their vows. My parents, Joe and Bobbi, did exactly that on June 17, 1956. and they are still going strong after 53 years of marriage! While I was coloring and cutting out the Elzybells images, I also made a couple of wedding cards, which I will donate to Wildlife Aid's Open Day and Charity Event on Sunday, June 21. Hubby Niall and I also celebrate our 23 years of wedded bliss on June 14. Although that's a lot of years for marriages these days, it doesn't even come close to comparing to my parents' anniversary! Bride & Groom and Congratulations stamp are from Elzybells; Happy Anniversary is from Ink N Rubber. A couple of weeks ago, I was doing a random search online for Spellbinders Nestabilities, and I stumbled across the Prairie Paper & Ink's blogspot and a precious Father's Day Frame. I couldn't help myself; I had to make one for my dad, who lives in Texas. Above is my interpretation of the project. I currently don't own the Nestabilities scalloped squares, which is one of the things I was trying to source online. Therefore, I created my scalloped edge by using my new Stampin' Up scallop edge punch. I used a corner rounder on the two pieces of matching cardstock and the thin cardboard that will go inbetween. The cardboard makes the backing firm. I used double side adhesive to stick the three-piece sandwich together. The top piece of patterned cardstock was run through the Wizard with a Nestabilities square die. Choose one big enough to leave room for your stamped image. I ran the frame through a second time with a slightly larger square die to emboss the frame hole. Cut a piece of complimentary solid cardstock and stamp your favorite sentiment. Of course, this is where you could use a favorite photo of your loved one instead. This makes such a super gift, regardless what you put inside the frame. The sentiment stamp I used is from Elzybells. Here is more art from a recent swap on our England Stamping & Crafting Yahoo Group. The art mingle featured vintage tags, and we made two different tags for three recipients. One of them features a bride stamp, which is absolutely gorgeous! I bought it from my friend Beckie. The stamp is huge, but I was determined to use it on the tag mingle. I stamped the image onto Shrinky-Dink and colored it with Tim Holtz distress inks and chalks. The heart on the tag comes from a new prima product, stitched mulberry paper, which is beautiful stuff! Prima Flirty paper and flowers were used for embellishment. The other tag features a Magenta rubber stamp, which comes as a set of four female faces. I recently unmounted and cut the stamp so that I could easily use each of the faces individually. This tag might look familiar as it is the same stamped image and paper that I recently used when making an artist trading card. The princess and word stamps are from Stampin' Up. Our England Stamping Yahoo Group recently had an art swap featuring some really cute 3-by-3-inch cards with matching envelopes. If you are interested in the envelope template, you can find it on an earlier post by clicking here. Once I got started making these cards, I couldn't stop, and I had to try out all kinds of combinations. One card design features a Cuttlebug butterfly die cut, which was then sandwiched into an embossing folder colored with ink. The ink sinks into the low areas of the embossed image. Another card features a Stampin' Up flower stamp, which has been colored with Copic markers and cut out. Another is a bee from a Close to My Heart set, and it has been embossed with thick UTEE embossing powder to give it a glass effect. And finally, I used Spellbinder's dies to cut a window into a card and used a Lost Coast dictionary stamp and Stazon to stamp on acetate. The flower on this card was handmade by cutting out Spellbinder's scallop circles. One of my favorite paper crafting companies is BoBunny, and their creative people recently had some great teacher appreciation gifts on their blog. If you scroll down BoBunny's blog, you will see where I got the idea for the notepads that I've made and displayed here. The flowers are all from Stampin' Up rubber stamp sets. The images have been colored with Stampin' Up! ink pads and Copic Ciao markers. Then they were cut out, so they could be easily moved around and displayed. The bit of flourish is a clear stamp set by Amy Smyth and Inkadinkado. I used my ProClick to bind the notepads, which are made from 12 x 12 pieces of black cardstock, which has been cut into quarters (6 x 6). White copy paper was then cut into squares. If you don't have a personal binding machine, buy notepads and adhere the cardstock and embellishments to them. When making the notepads, I discovered that I didn't have stamps that were large enough to create the word 'notes.' I tried free-handing and using stencils, but alas, nothing looked right. In the end, I created a piece of faux notepaper and computer-generated the image, which I have posted below. 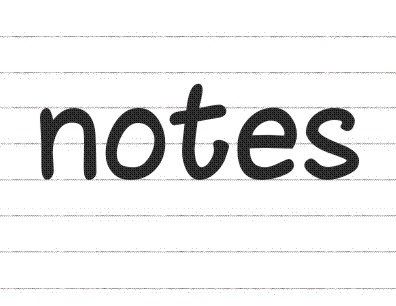 You can save and use them in your own notepad project. 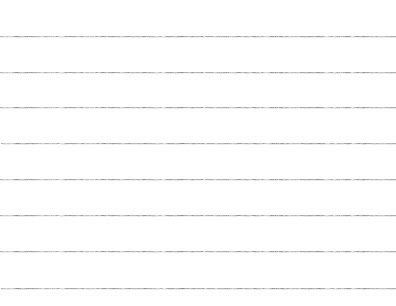 I have posted in two ways: 1) notepaper with the word 'note' and 2) notepaper only, so that you can stamp the word 'note' if you have large enough alphabet stamps. Amount of time: Very time-consuming and fiddly; however, it gives your hands something to do if you are sitting in front of the television!